Prime Minister Justin Trudeau, right, met with auto parts executives in Toronto. Editor’s note: An earlier version of this story understated the number of Canadian manufacturers operating in Mexico. A meeting Feb. 27 between Prime Minister Justin Trudeau and key players in the auto supply industry suggested possible federal-industry collaboration in efforts to shield Canada’s auto industry from disruptions threatened in the United States. 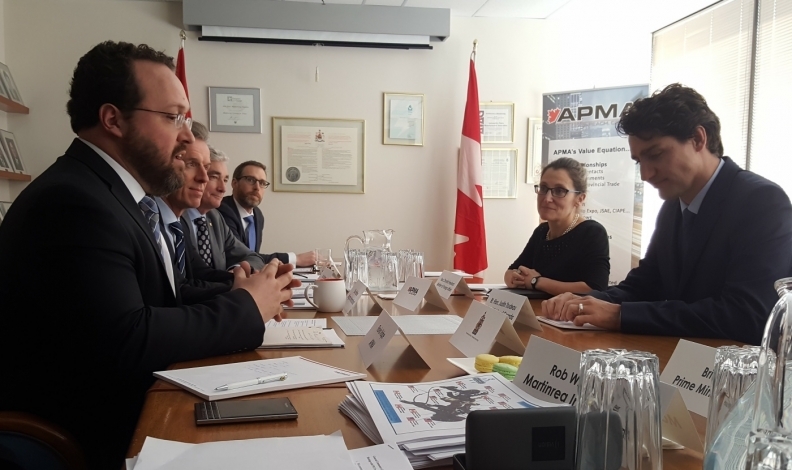 The roundtable discussion with high-ranking officials from the auto parts sector included Automotive Parts Manufacturers Association (APMA) President Flavio Volpe, Martinrea International Executive Chair Rob Wildeboer, Magna International CEO Don Walker and others. Trudeau brought with him Chrystia Freeland, Canada’s point person on NAFTA. Volpe said Trudeau has “intellectual curiosity” about the industry. Auto parts makers are concerned about economic policies that the new Trump administration might implement. Trump and House Speaker Paul Ryan have called for a border tax on goods imported to the United States. The value of the tax ranges anywhere between 20 and 35 per cent. Linamar CEO Linda Hasenfratz, who wasn’t at the meeting, previously raised her concerns about the possible tax in an open letter to Trump, published on Automotive News Canada’s website, noting that an auto part crosses the border several times before it ends up in a finished vehicle. Trump has also pledged to renegotiate NAFTA and withdraw altogether if he feels a new deal doesn’t present American workers with what he calls a fair deal. Monday, Walker told Trudeau that the integrated North American auto industry needs protection. As the meeting began, Trudeau said in video posted by the Canadian Press that the group was going to discuss "how we can look at perhaps some new opportunities with our neighbours to the south or, at least, demonstrate the high level of integration between our economies, particularly in the auto sector. [It] needs to be continued and protected and recognized as a tremendous driver of jobs and opportunity on both sides of the border." Trudeau and Trump already met in person Feb. 13 in Washington and talked trade. The discussion Monday also touched on the role of the Canadian government, including co-investment in and taxation of the auto industry but “trade was the focus,” Volpe said. “They asked us what we thought was important in current and upcoming discussion on Canada-U.S. relations,” Volpe said. The executives told Trudeau that Canada is a good partner for the United States and Mexico, where about 65 Canadian companies operate about 120 auto parts facilities. “NAFTA has worked for us in general and it works for the automotive industry,” Volpe said.